Beautiful rug! The colors are amazing! 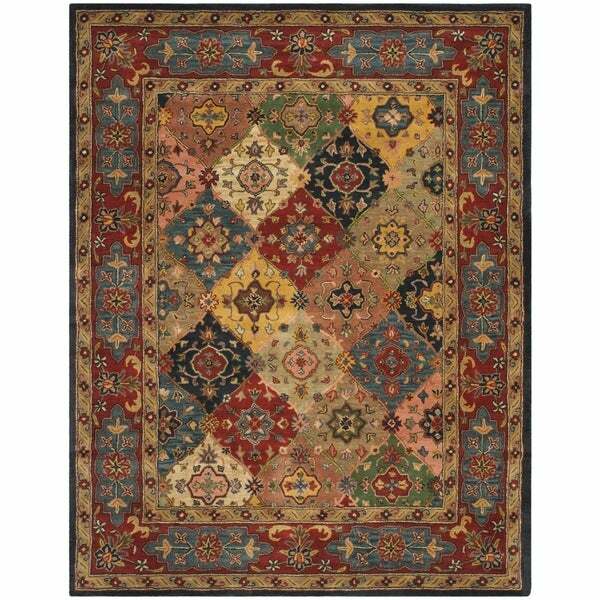 This is a beautiful rug with vibrant colors and a thick wool pile. The colors are remarkably similar to those pictured on my screen. I particularly like the unique shade of rose in the main body of the rug. As stated in the product care instructions, this rug does shed for the first few times that it is vacuumed. I would highly recommend going over it once or twice with a vacuum immediately after receiving it to minimize shedding. The rug was well packaged; sealed in a plastic bag inside of a cardboard box. I did not notice any unusual smells when I opened it. Overall I am very satisfied with my purchase and would recommend to anyone looking for a sturdy new rug. I LOVE this rug! The colors are vibrant but not gaudy. I would call them rust, slate blue, sage green, light and dark taupe, light and dark mustard, light salmon and black. The rug is a nice heavy weight that lays very flat. Not a huge fan of the amount of fibers I am picking up with the vacuum, but that's natural with a wool rug.-hopefully it will ease up as time goes on. I've only had it about a month, so can't speak to how it will hold up. I'll write another review later if it disappoints, but for now I love it. Love, love, LOVE this new rug! I love the rich jewel tones that this rug has in it! 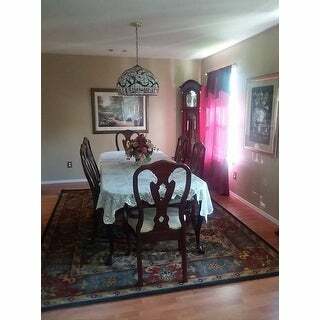 My picture quality is not the greatest on my phone, but it looks wonderful in my dining room. This rug is beautiful and excellent quality. The price point is amazing for how nice the rug is. It comes very well packed. Do not let your rumba on it for the first month until the shedding has stopped. If you vacuum more than I do, which would be pretty easy, it may be less than a month. But it will totally clog your rumba at first. Very nice thick wool rug, nice vibrant colors that will suit most decors. Nice rug--and delivery was spot on and well packaged. Love it! Took a chance given that there were only 3 reviews but we are glad we did. Additionally the rug was well discounted in addition to a coupon. The colors are as shown in the picture and can truly be paired with any type of furniture, traditional or contemporary. This is a really nice quality rug and it is even prettier in person. The colors are really rich and earthy. The dark blue is more prominant than the gold which makes it better than shown. Could not ask for a better rug. Beautiful design, colors, and quality. We ordered the 8 x 10 and it fits the den perfectly. The variety of rich colors makes it easy to decorate. This rug makes our den feel warm and inviting. Beautiful rug at a reasonable cost. Colors are true to what's on-line. Gorgeous! Get compliments from everyone who walks into my house. Beautiful rug. The colors add so much to the room allowing me to pull in so many options. I love this rug. Arrived quicker then expected and warms up my living room exactly how I hoped it would. Beautiful! It should fit my space and is a beautiful rug. It looks elegant...lush and warm, exactly the ambiance I'm trying to create. "Is the darkest color in this area rug navy or black?" It is a dark navy color.